The Prince This project is worth TWO Exam grades and is due the first class day after Christmas break. Choose ONE from EACH Section Section One: Written. 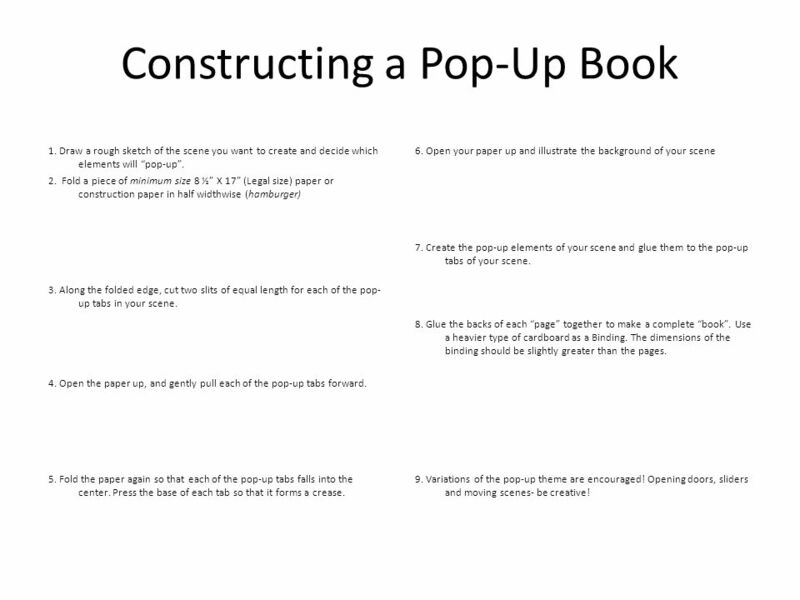 2 Constructing a Pop-Up Book 1. Draw a rough sketch of the scene you want to create and decide which elements will pop-up. 2. Fold a piece of minimum size 8 ½ X 17 (Legal size) paper or construction paper in half widthwise (hamburger) 3. Along the folded edge, cut two slits of equal length for each of the pop- up tabs in your scene. 4. Open the paper up, and gently pull each of the pop-up tabs forward. 5. Fold the paper again so that each of the pop-up tabs falls into the center. Press the base of each tab so that it forms a crease. 6. Open your paper up and illustrate the background of your scene 7. Create the pop-up elements of your scene and glue them to the pop-up tabs of your scene. 8. Glue the backs of each page together to make a complete book. Use a heavier type of cardboard as a Binding. The dimensions of the binding should be slightly greater than the pages. 9. Variations of the pop-up theme are encouraged! Opening doors, sliders and moving scenes- be creative! 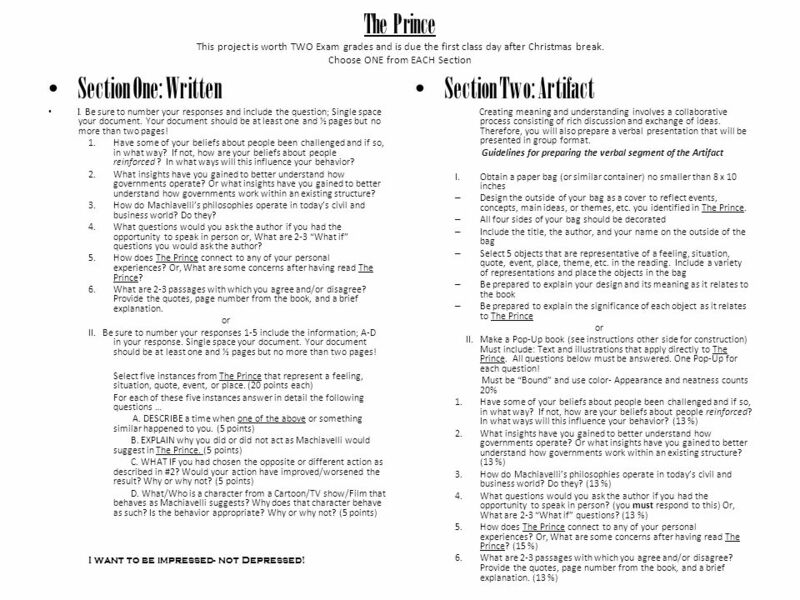 Download ppt "The Prince This project is worth TWO Exam grades and is due the first class day after Christmas break. Choose ONE from EACH Section Section One: Written." Literacy Instructions Thursday 7 th January 2010 Making a pop up card. Warm Up Diagram the following sentences: 1.Rita ate dinner. 2.Eat your dinner. 3.Carlos brought Kate juice. 4.The genie gave Mike a wish. 5. Did Patty. Who deserved the credit for the discovery of penicillin? Masque of the red death 1 – On your blank sheet of paper, write down all the symbols you can find in the Masque of the Red Death and briefly explain their. Guidelines/Grading Rubric Provided by Ms. Wigfall Guidelines for Reader’s Circle Product. Evan Payne GCISD Instructional Coach. Complete this statement based on the concepts you learned today. 1.Take 15 seconds to reflect and really think about. Splash Reference Foldables Reference Foldables Click the mouse button or press the space bar to continue. Inspiring and Supporting Linguistic Creativity Nicole Naditz, NBCT CLTA Conference: March, 2011. How to Create a Magic Mini- Dictionary. Start with a 12x17 sheet of colored construction paper and two pieces of 4 ¼ x12 lighter-colored construction. O F M ICE AND M EN HALFWAY PROJECT. H ERE ’ S WHAT YOU HAVE TO DO : It is the halfway point in Of Mice and Men, and you will be creating a scrapbook of. Cultural Practices of Writing II. Writing Processes as Schooling Explore writing processes as situated within schooling. Or Explore writing/reading process. L ITERATURE C IRCLES Grade 11 English Adapted from Allen.